The research programs in Leuven and Taipei as well as cooperation with the Chinese church in the fields of pastoral animation and formation were the first ones that started to develop and take shape under the patronage of Verbiest Foundation. 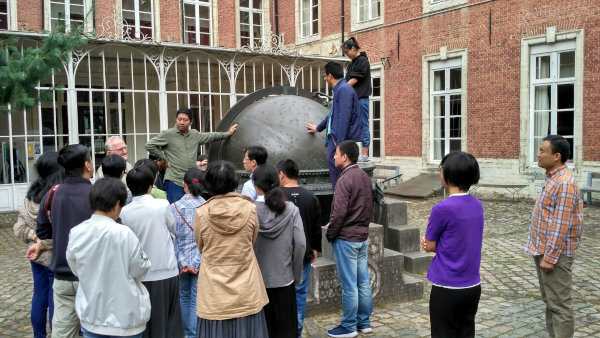 Soon, new possibilities of dialogue and encounter, like residential scholarships in Leuven or exchange programs and visit of Chinese bishops and governmental religious authorities, pointed to the need of having a base in Belgium. As Verbiest Foundation's research program was incorporated into Leuven Catholic University (KULeuven), to look for a place in or nearby Leuven seemed the best option. The solution came through the CICM former seminary house in Leuven which had lots of space available, and VF started to make use of that space. Few years later, due to lack of vocations and aging of members, this house in Leuven was increasingly becoming a burden for CICM; on the contrary, for VF this house had become a springboard, a great opportunity to expand the programs already in place and to develop new ones both in the research and pastoral fields; ownership and its costs required deep discernment. In the end, the board of Verbiest Foundation approved the acquisition of the house from CICM and to get it ready to host encounters and programs aiming to strengthen the pastoral dynamisms of the Chinese local churches and to promote exchange and dialogue between the Catholic churches and communities of Europe and China. This effort to have a welcoming space near Brussels, the heart of Europe, is a clear sign of the commitment for partnership and engagement in dialogue of Verbiest Foundation.